Millipedes many times invade your home after heavy rainfalls or when they are in search for a place to overwinter. Good news is that millipedes are not poisonous and are a mere nuisance to your home or business. They like to live in moist dark and damp areas such as your basement. The problem with millipedes is that they are not insects, and most insecticides you buy to do it yourself will have no effect on them. 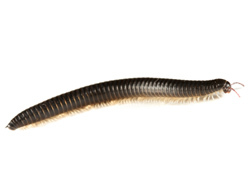 At Eco Tech we are trained in dealing with millipedes, and have effective and earth friendly pest treatments. We will use our less toxic organic product line to exterminate the millipedes, and we are friendly and flexible to work with.